Mahaffey Fabric Structures was asked to provide a semi-permanent hangar solution for an aviation company in downtown St. Louis, Missouri. Jet Aviation, formerly known as Midcoast Aviation, provides an array of maintenance, repair, and overhaul (MRO) services, including sophisticated structural repairs, avionics upgrades and repairs, interior design and refurbishment, exterior design and painting, and component and accessory service. Jet Aviation was in need of a way to house several Bombardier jets, including three Global 5000s, one CL-850, and nine Challenger 605s, while performing comprehensive MRO services. The problem? There was a shortage of hangar space. 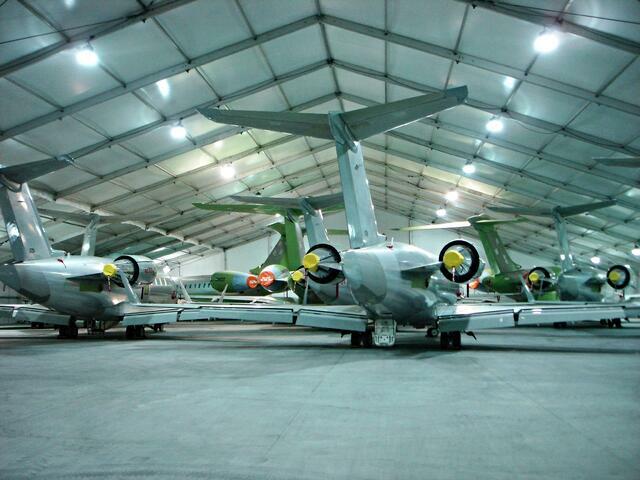 Jet Aviation was already in the process of building a large, permanent hangar on-site. However, it was several months from completion, and the company had to find an immediate storage solution. After performing a bit of research, the director of FBO services at Jet Aviation, Mike Mueller, called Mahaffey. His request was to install a portable hangar that would provide adequate space for the jets until construction for the permanent hangar was complete. With over $400 million worth of aircraft to be covered, it was imperative that the structure offered sufficient protection and could sustain unpredictable weather conditions. Mahaffey erected a 164’ x 282’ temporary hangar with 13’ eaves and a peak height of 40’ on Jet Aviation’s semi-level tarmac. 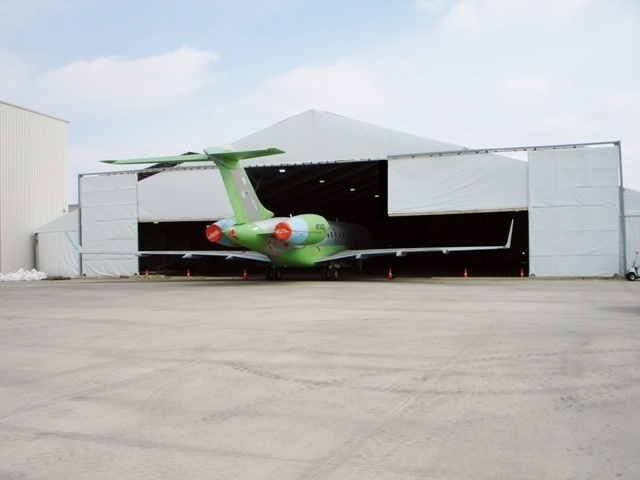 Insulated steel panels were installed on the sides, and a customized hangar door was constructed to allow for the Bombardier jets to be moved in and out with ease. Four 3-million BTU propane heaters were used to keep the interior heated during the harsh winter months, and the structure was engineered to meet the county’s building codes. Mahaffey’s hangar solution significantly increased the productivity of mechanics, repair technicians, and several other Jet Aviation employees. The worker-friendly environment has been so well received, the company has kept the structure as year-round weather protection for routine FBO services. Are you looking for a semi-permanent hangar with custom amenities?